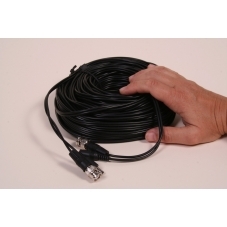 Pre-made camera to DVR cables are the easiest way to wire your CCTV camera system. They use industry standard connections for both the video signal and 12 volt power supply. Pre-made cables do require larger holes due to the size of the connections and there is a risk of damage when pulling through. Consider using CAT5 cable, the connections only need a screwdriver.